This morning another mile stone was reached: WAW 300 was delivered at TNT with as final destination Adam in the USA. Adam got the lucky number by chance as the numbers are given in the sequence of ordering but we were very happy that such an order was the winner. 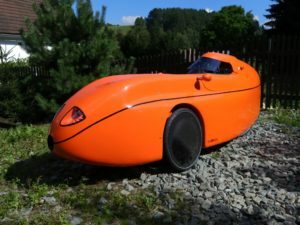 WAW 300 is indeed a very complete, mature and beautiful velomobile that we were proud to build and to deliver. The WAW is a Kevlar version, equipped with the new rear suspension, the robust and customer friendly Rohloff transmission, a chain protection in the rear, the 250 W Bafang mid-drive engine, a compact N3 nose fairing and a T3 tail fairing specifically created for the rear suspended WAW@2016. Such a configuration is ideal for comfortable commuting and even longer travelling, keep in touch for the next newsletter to know more. Adam developed a specific WAW 300 logo that you found on top of this page. More pictures of WAW 300 can be found in our gallery. We have a special thought for Devin and his family when writing this article. Thank you for building such a beautiful Velo! Someone asked me the name Susan John I name all my bikes. This one is named Susan John because my grandfather use to say that when he was a short wave radio operator (HAM radio). The name Susan John use to be how he would call out two of the letters in his call sign. He was an avid cyclist who help fuel my love for cycling. He biked all the way up to the age of 93. Just thought i would share the back story.